State lawmakers are considering whether to have a special session this month to vote on, among other things, a pay raise. Assembly Democrats are holding three days of meetings aimed in part on whether they should gavel into session later this month to vote to give themselves their first pay raise in nearly two decades. Governor Cuomo in recent days has publicly listed agenda items he’d like to see passed if there’s a session on salary increases, including, possibly term limits for legislators. But Assembly Majority Leader Morelle says that item is likely off the table because most Democratic Assembly members are against it. “They feel it strengthens the executive branch and strengthens the role of lobbyists and entrenched staff,” Morelle said. Cuomo has named many other items he’d like to see addressed, including strengthening the state’s hate crimes law, in the wake of bias-related crimes since the election of Donald Trump as President. Cuomo also wants to free up promised money to house the homeless. Morelle says those items are being considered. But Cuomo also wants to enact reforms, including converting to a full-time legislature and strictly limiting outside income, to answer recent corruption scandals that have resulted in prison sentences for the two former legislative leaders. The governor also wants to reform the state’s contracting process, to address a scandal in his office over economic development contracts. It includes creating a new post with some of the same powers as the present state Comptroller. Assembly Majority Leader Morelle says it’s unlikely, though, that lawmakers would be open to restructuring state government in a “rushed” end of the year session. “I don’t think that’s the appropriate time,” Morelle said. Cuomo and lawmakers had set up a pay commission. It was supposed to take the politics out of salary increases. But the governor’s appointed commissioners refused to take action on a pay raise proposal, hinting they might be more amendable later if lawmakers enact reforms that Cuomo is seeking. Assembly Speaker Carl Heastie has said repeatedly that he won’t just “trade a pay raise for any piece of legislation”. Heastie and Cuomo held a private meeting over the weekend, along with the Senate Leader. But the Speaker, after a two-hour closed-door meeting with his members, says there’s a distinction between a pay for play type of deal, and mutual agreement on approving measures that all sides agree to. “You can bring things up in a conversation, if everybody agrees that it should happen, then it’s not a trade,” said Heastie, who said lawmakers would not be “forced” to do anything they disagree with. Speaker Heastie was asked whether the legislature would on its own approve a pay raise for the first time since 1999, whether or not the governor approves the idea. He did not completely rule it out. 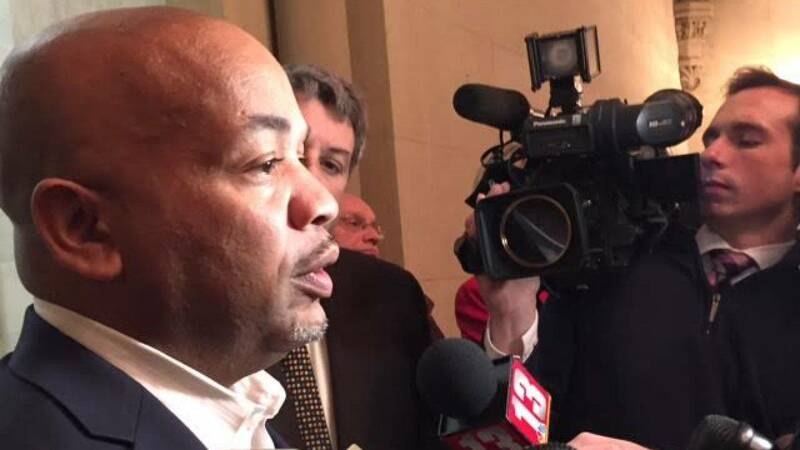 “I think in this world it’s always better to have agreements,” Heastie said. But he says lawmakers, even the governor himself, as well as his own commissioners, all deserve a pay raise.